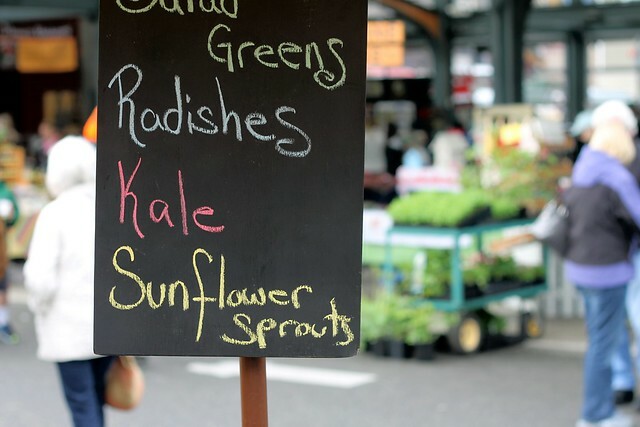 The Bellingham Farmers Market opened last weekend. Nettles, kale, radishes, the traditional throwing of the cabbage. (By the mayor, no less. Did you know I have a thing about celebrity sightings? Unhappily for me, the mayor of Bellingham is my lone conquest.) And lots of Bellinghamsters geeking out over local everything. Though I'm not disciplined or resourced enough to do all my shopping at the farmers market, going and spending whenever I can is fun and helps me feel more connected to the hard-working farms around here. My parents and I gathered a little picnic of aged Ladysmith cheese and a round of herbed focaccia from The Breadfarm. Even though it was gray and rainy, I couldn't help but feel more Spring-y. And radish-y. Serves two. Take 1 1/2 c. of cold, cooked grains. I used farro, but you could use lentils, barley, brown rice, quinoa, etc. 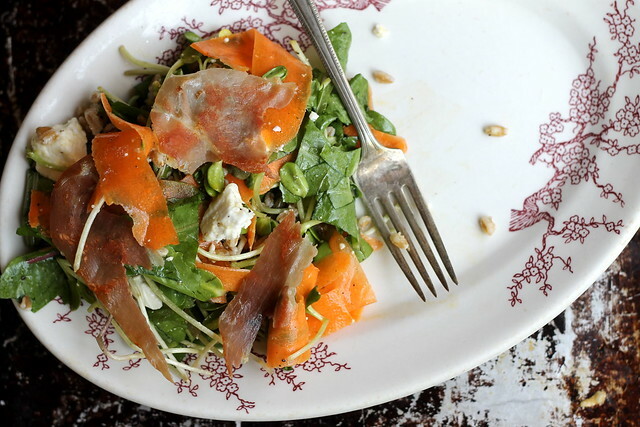 Toss them with a giant handful of sunflower (or other) sprouts, some chopped greens (I used dandelion greens), shredded carrot, a Tablespoon of capers, crumbled feta, toasted walnuts, a big squeeze of lemon juice, a little lemon rind, fresh ground pepper, and a big glug of olive oil. Taste before you salt it since capers and feta are so salty. I had some proscuitto around (my secret weapon these days) so I fried a couple slices and tore them over the top.